This is my new favorite pumpkin pie. It’s so good! And there are leftover gingersnaps that you get to eat! I love them with a nice, hot cup of tea. Make it gluten free by using Gluten Free Ginger Snaps! Run the ginger snaps through the food processor, blender, or use a rolling pin to crush them in a plastic bag. It just takes a couple of handfuls, so crumb them then measure, so you don’t end up with a lot of extra crumbs. Of course, they can be saved in an airtight container until you make pie again. Mix the crumbs, sugar and butter. Spray the pie pan, I prefer using glass pie pans. Press the crumb mixture into the pan and up the sides. Bake at 325* for 5 minutes. Cool. Can be stored in fridge up to 2 days before filling. Combine everything in a bowl. Whisk well. Pour into shell. Bake 325* 1 hour or until firm. Serve with lots of whipped cream! If you should happen to have any leftovers, store them in the fridge. This looks sooo good!! Thanks for sharing!! yum yum yum I want to try to make that too! thanks for stopping by from TTA. I'm following you back! Pumpkin and gingersnaps are the perfect combination. I think I'd prefer this type of crust to the pastry one. 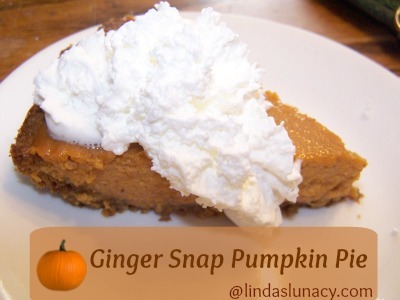 I just love a gingersnap crust with pumpkin pie. The pumpkin and gingersnaps go together so well. And yes, LOTS of whipped cream! Looks yummy! Oh good gravy, I am drooling. Ginger snap pie crust?! That sound heavenly. I can't wait to try out this recipe! I would love for you and your pie to participate in our Friday Food Fight. I would've never thought to use gingersnaps for the crust! Wow it looks absolutely delish! Will definitely be trying this recipe! Thanks for playing along in our FFF! Looks delicious! You can never go wrong with a big scoop of whipped cream. The gingersnap crust sounds wonderful too. I made this pie for Christmas Brunch and it was a big hit. The only problem was it didn't look like yours. My crust kind of bubbled up to the top so it looked like it had a double crust. Any ideas on how to prevent this? Made 2 pies and it happened to both. Saw your tweet regarding this recipe and here I am! The gingersnaps brought me!